This bright autumn dairy-free butternut squash soup is simple and inexpensive to prepare, and it's great for fall-time family dinners, Thanksgiving dinners, or casual get-togethers with friends. This recipe is incredibly versatile, so feel free to add fresh herbs, spices, or even nuts of your choice. You might also have it paired with a sandwich. In a large stockpot over medium heat, heat the olive oil and sauté the garlic, onions, and celery, stirring often, until soft and fragrant - about 5 minutes. Add the carrots, butternut squash, and vegetable stock. Bring to a boil, then reduce the heat to low and simmer until all of the vegetables are tender - about 30 to 40 minutes. Working in batches, transfer the soup to a blender and process until smooth. Return the soup to the pot. Stir in the soy milk, salt, and pepper, and cook until desired temperature and consistency, adding more soy milk as desired. When looking for squash at the store, if long-term storage is your goal, choose blemish-free butternut squash with hard, dull skins and at least an inch of stem intact. Squash with soft spots, mold, or other damage won't keep for long. Opt for squash that feels heavy for its size. That's an indication that it's fresh. Store your fresh, uncut squash in a cool, dark place, such as a basement or closet, where sunlight won't hasten its ripening. Under the right storage conditions, your butternut squash should last two to three months. To prep the squash, use a vegetable peeler or y-peeler to peel the squash. Slice the squash in half lengthwise and scoop out seeds. Cut the squash into 1-inch cubes. 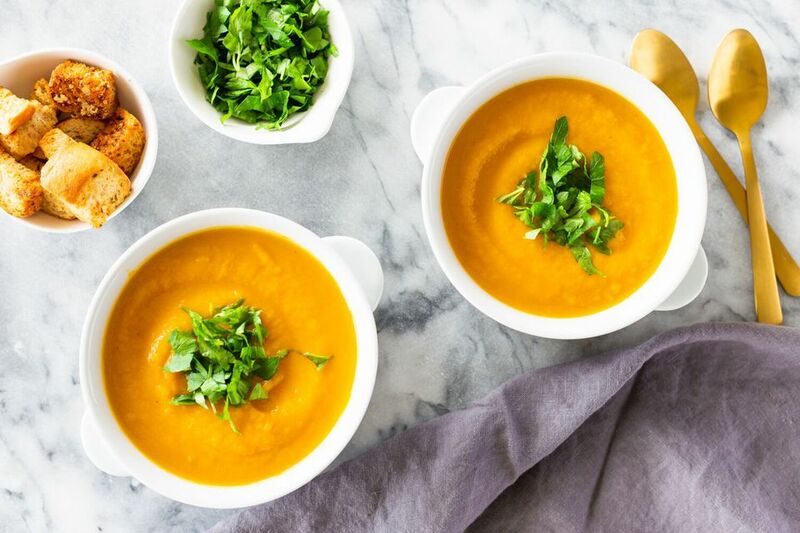 Try butternut squash as an entree with dairy-free bread, or add any type of legumes such as white beans, black beans, split peas, or ​black-eyed peas to the soup for a heartier, more filling meal. If you have butternut squash as a side dish with meat as the main course, it's fine without additional ingredients. As the main course, you can also add greens, such as sautéed kale, turnip, or collard greens, to the mix for a complete meal. The smoky taste of the butternut squash pairs well with the sweetness of fruit such as apples and cranberries. Butternut squash is so versatile it can be included to add character to other sauces, spreads, or jams. Add butternut squash soup to pasta sauce to give it a different texture and add nutritious veggies. Add butternut squash to cheese for a creamy sauce that has a bunch of fiber to boot. You might add butternut squash soup to mashed potatoes to give it a different taste than you've had before, or roast butternut squash on its own as an alternative to mashed potatoes that are more colorful and has a fuller flavor. What's the Best Way to Brown Onion Paste?